For the first time, a Kingdom of Saxony reverse alphabetical index is available to the public. Such indexes have been known and valued among researchers in the Family History Library for some time, but none have been available in print or microform. The Reverse Alphabetical Index allows the researcher to determine the name of a town when the first part of the name (whether one or more letters) is missing. This is a common problem caused by torn or moldy pages, ink-blots, tight bindings, poor microfilm quality, etc. By using this index, the researcher can also determine the official spelling for towns when variant spellings occur in old records. The book includes a regular alphabetical index of all the towns in the province as well as regular and reverse alphabetical listings of over 3,650 names of German kingdoms, duchies, principalities, counties, rivers, mountain ranges, and other geopolitical and topographical entities. 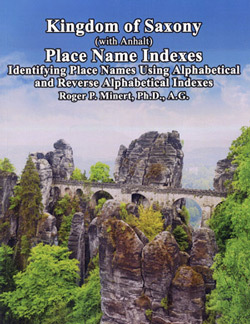 There is an earlier edition of Kingdom Of Saxony Place Name Indexes available at 50% OFF. There are only a few copies left!